GLORIA: Hi, Barbara! Thanks for taking time to be a part of this issue on country music and its connection—first cousins we call it—to gospel music. You started your music life very early, as a child playing the guitar, traveling with Johnny Cash at 12, and recording when you were just a teenager. Tell me how your life was connected to gospel music? Did you sing in church when you were a kid? Were gospel songs a part of your young life? I had been playing steel guitar and saxophone for six months when I got my first job in Las Vegas at age 11. When school vacations would allow, I did return engagements in Vegas with Tex Ritter, Little Jimmy Dickens, Red Foley and other stars. At home in California, I was a regular on a Saturday night live television show called “Town Hall Party.” A couple of months after my 13th birthday, I worked my first touring engagement playing saxophone and steel guitar on Johnny Cash’s show with Patsy Cline, George Jones and several other name entertainers. I am grateful that I “grew up” in country music with legendary performers who taught me by example to include at least one gospel song in every show. Gospel music’s always been so much a part of me that I’ve just naturally included it on all of my shows. Most often I would choose to do a medley of gospel songs so that I could sing more of my favorites! 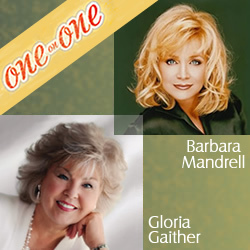 In preparation for the NBC series, “Barbara Mandrell and the Mandrell Sisters,” I said we would be doing a gospel music portion the last five or six minutes of our show. And the TV people said no, we wouldn’t. My father/ manager, Irby Mandrell, and I told them to let us do it our way on the first show and see how it went. Praise God, because of the phenomenal outpouring of appreciation from Christian viewers, the network felt the gospel section was one of the best ideas they ever had! In all seriousness, I thank God so much for putting us on network television and allowing us to average 40 million viewers a week. Our very first show we booked Andraé Crouch, followed by the Blackwood Brothers the next week. GLORIA: I think of you as an artist that has so many gifts—you’re an amazing singer, a transparent communicator, a bundle of creative energy on stage and off (giving of yourself so generously in relating to those who wanted a moment of your time) and a consummate business woman. How did your spiritual life sustain you when there were so many demands on your energies? BARBARA: My heavenly Father and He alone took me and my family to places and gave us experiences we could never have dreamed of or imagined. Every time I have been asked for my advice by a newcomer, I tell them I asked God to guide me on every decision in my business life and my personal life, big or small. In retrospect, I am overwhelmed at the exciting, spectacular journey God took me on in my career. God is so amazing. One of my minister friends once told me I had the privilege of taking gospel music places it normally does not go, and that hugged my heart. GLORIA: At the height of your very popular TV show, you had a head-on accident that left you badly injured, and during your recovery you found that you were pregnant with your son Nathaniel. Did you find that there were songs that helped you through this time? Were there experiences that you can remember that gave you strength? BARBARA: Your question opens the door for me to share something concerning that head-on car crash on Sept. 11, 1984. Gloria, I am sure you and your readers get this... we never wore seat belts. Approximately 20 minutes before the crash, the kids and I witnessed a very scary sight at a traffic light. Two little children were playing in the back of a station wagon with the tailgate down. Even to non-seat belt wearers, that was so obviously dangerous. All three of us felt fear that something bad could happen to them. I absolutely know the words I spoke at that moment were not from me. I told the kids, maybe to lighten the mood, “Let’s put on our seat belts, and then at least we’ll be safe.” Shortly after that, a car ran into us head on at 55 miles per hour. I have no memory of the collision. The experts said without seat belts, all three of us would have been dead. The young man who hit us was killed instantly. Because of my head injury, I only have memory of what people told me and the knowledge that God built a wall of protection around us. Concerning our third child, Nathaniel, for a few months before the car crash Ken and I had been praying and hoping for a third child. I was of course very disappointed that I wasn’t pregnant. Again, thank you God for letting me have Nathaniel after the car wreck so we didn’t lose him. The head injury made me speak of Barbara Mandrell in the third person. Someone would send something that needed my signature and I would say they should’ve asked “her.” I was never going to perform again. My father asked me to perform one more time. He said I should determine when I quit and to not let a car wreck or head injury dictate when I quit. So, I did what my daddy said. There are no words to describe what my husband Ken did for me during this time. He is a strong man. GLORIA: The Homecoming artists had a wonderful time in your big log house you named Fontanel when we filmed the Giving Thanks videos. What made you and your husband want to create such a warm and welcoming place? BARBARA: Ken and I spent a year and a half with our architect Seab Tuck designing Fontanel. Every decision made was based on love. We had a son in high school, a daughter in grade school and a baby son. We tried to make it wonderful for all ages to enjoy. There was a log playground, a tree house, a soda-fountain room, indoor swimming pool and a great room for entertaining large groups. We came up with the name “Fontanel” on one of our early pediatrician visits with Nathan. The doctor said something about the fontanel. And I said, “What does that pretty word mean?” The doctor told me it was the soft spot on a baby’s head. Ken and I smiled at each other and said, “That’s it,” because our home had been built with all three of our babies in mind. And as Ken always loved to tell people, it was also the soft spot in his wallet! GLORIA: You seem to have been able to manage an incredibly complex career and still keep the focus on your family. Not long ago Bill and I had a lovely homecooked dinner at your house, and there is a great feeling of peace there and in your rose gardens which you have loved and tended since your retirement. Can you talk about your faith and this chapter of your life since retirement? BARBARA: All but the first 11 years of my life, I spent working in my career in show business. In 1997, I began to think about retirement. My youngest son was ready to go into high school and I had spent over 38 years with my career. I decided I would like to be a stay-at-home wife and mother. (I always like to say I never worked so hard for no money in all of my life! God bless all homemakers!) Ken and I prayed for God to give us the right decision. That decision came fast. Three months later, the end of 1997, I did my last show. I know that God made that decision for us because everything He decides for us is perfect and I have never had any regrets. I have the deepest gratitude for the indescribable love, goodness and support that people gave me all through my career. I’m so happy and content with my retirement, but because of my profound love for my family, it didn’t surprise me when I gladly said “yes” to my daughter-in-law Christy Sutherland when she asked me to join her in producing her new album. Greater Still is an album I will listen to and treasure always, not because I’m proud that I produced it, but because it is all things that thrill me in music. Christy’s voice is powerful yet sensitive. The words God fills her heart with are so alive and moving they truly touch me. Even in the studio, there was the unmistakable Presence of the anointing of the Holy Spirit. For me personally as a listener, I adore the variety of music on this album. The title song, “Greater Still” is a duet with Jason Crabb. I am crazy about Jason! He is one of the very few people I’ve met in my life whose kindness, sincerity and warmth made me feel as though I had known him forever. He is the real deal. And he sure can sing! I am so glad that Christy invited Jason to sing with her and allowed me the opportunity to get to know such a good friend. By the way, Gloria, my daughter-in-law Christy and my son Matthew are the ones who brought you and Bill into my life, and for that I am forever grateful and such a lucky girl! Thank you for spending this time interviewing one of your biggest fans — me!